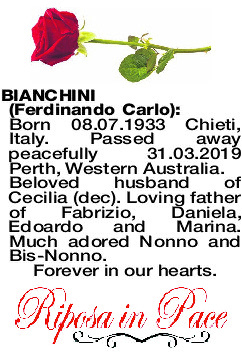 The Funeral Mass for Mr Ferdinando Carlo Bianchini formerly of Stirling will be celebrated in St Mary's Roman Catholic Church, corner Franklin and Shakespeare Streets, Leederville commencing at 10.00am on MONDAY (08.04.2019). 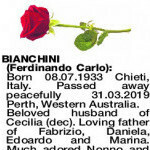 The Cortege will leave the church at the conclusion of the Mass and arrive at the main entrance of KARRAKATTA Cemetery, Railway Road, Karrakatta at 11.45am for the Entombment Service at the Mausoleum. Vigil Prayers and Rosary will be recited in St Mary's Church, Leederville at 7.00pm on SUNDAY (07.04.2019). Born 08.07.1933 Chieti, Italy. Passed away peacefully 31.03.2019 Perth, Western Australia. Beloved husband of Cecilia (dec). 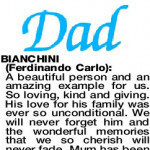 Loving father of Fabrizio, Daniela, Edoardo and Marina. Much adored Nonno and Bis-Nonno. A beautiful person and an amazing example for us. So loving, kind and giving. His love for his family was ever so unconditional. We will never forget him and the wonderful memories that we so cherish will never fade. Mum has been gone for almost 13 years and he missed her ever so much. So not long my beautiful Dad and we all meet again in Paradise on earth. Psalms 37:10 & 11. Cherished father of Marina and much loved father-in-law of Greg. Much adored Nonno of Clarecia and Riki Bis-Nonno of Saraiya. 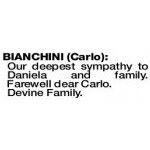 BIANCHINI CARLO Our deepest sympathy to Daniela and family. Farewell dear Carlo. 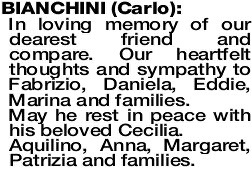 BIANCHINI CARLO In loving memory of our dearest friend and compare. 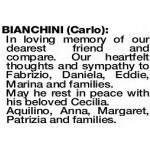 Our heartfelt thoughts and sympathy to Fabrizio, Daniela, Eddie, Marina and families. May he rest in peace with his beloved Cecilia. Aquilino, Anna, Margaret, Patrizia and families.